Healthcare Professionals – Begin Healing, Inc. The Alpha-Stim® AID and Alpha-Stim M devices can help your patients reduce pain, feel better, and live better, quickly and safely. Call or email for practitioner volume discount pricing at (877) 569-2583 (in USA), + (218) 327-0444 (outside USA), or info@beginhealing.com. *Patient self-reports after using Alpha-Stim technology for at least 3 weeks. Alpha-Stim is supported by over 95 completed independent research studies and published reports that utilize some of the most rigorous, controlled clinical study methods. Again and again, Alpha-Stim has proven to quickly and safely provide relief from pain, anxiety, depression, and insomnia. Quickly and safely help patients get relief from symptoms of anxiety, depression, and insomnia. This training video is on a DVD that comes with each Alpha-Stim AID device. You can confidently prescribe Alpha-Stim to supplement medications for patients suffering from acute, chronic, and post-traumatic pain, and to help control mood conditions. You can also use it as first-line therapy for patients unresponsive—or not sufficiently responsive—to medications. Once you’ve gotten your patients’ condition(s) under control, you can decrease use of the device. Alpha-Stim is that powerful. "The Alpha-Stim has so much good science behind it, with many highly controlled clinical studies—this really proves its unique effectiveness for so many types of patients. And you can’t ignore the incredible safety record with no serious side effects. That’s why I recommend it to many of my patients." Alpha-Stim delivers solid relief to patients time after time, as demonstrated in numerous clinical studies conducted over 30+ years. Alpha-Stim delivers lasting results without dangerous side effects, tolerance, or addiction. In 30+ years and clinical studies involving more than 8,800 people, Alpha-Stim users have reported no serious side effects. The two most common side effects were headaches (0.1%) and skin irritation at the electrode sites (0.07%, only seen in light-skinned people). And Alpha-Stim is so easy to use, you can administer it yourself at home while relaxing, reading, using a computer or watching TV. Built-in safety features ensure that the device is functioning properly. Small and portable, Alpha-Stim is easy to take with you, wherever you go. 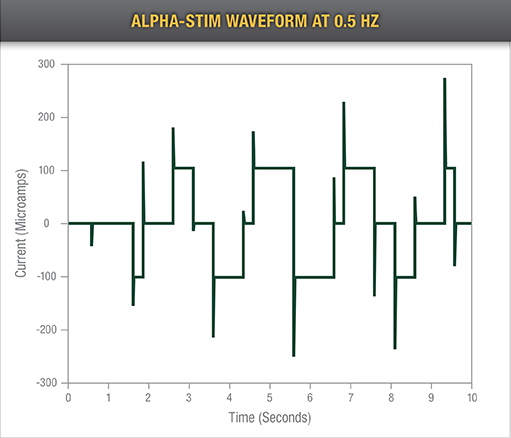 Over a five year period, Alpha-Stim users can save thousands of dollars compared with drugs and other treatments typically used to treat anxiety, insomnia, depression and pain.12 When you consider the results that are possible with the Alpha-Stim and the safety of the therapy, it’s clear why we believe there’s no better value available. Although rare, please note that Alpha-Stim may put patients into a euphoric state that temporarily limits their mental and/or physical abilities to perform potentially dangerous tasks for several hours. Advise them to be careful when operating a car, truck, or heavy machinery until they know how Alpha-Stim affects them. You won’t have to worry about lasting side effects. None have been reported. Some patients get occasional self-limiting reactions such as lightheadedness, headaches, or skin irritation from the electrodes. Mellen RR, Mackey W. Reducing sheriff’s officer’s symptoms of depression using Cranial Electrotherapy Stimulation (CES): A control experimental study. The Correctional Psychologist. 2009; 41(1):9-15.